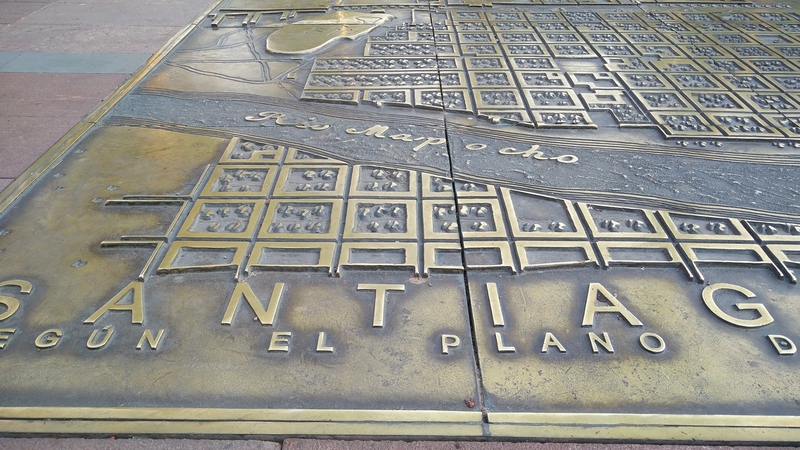 Departure on Friday evening, Amsterdam – Buenos Aires – Santiago de Chile. Just before arrival in Santiago we have a great panorama on some high peaks of the Andes. 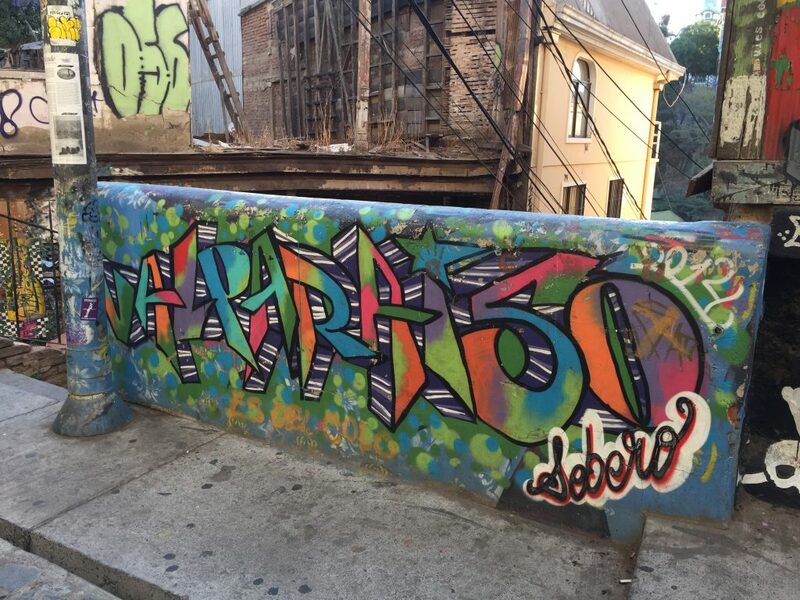 In Santiago we spend a day with Dutch-Chilean friends who take us for great almuerzo (lunch) with chelada (beer with lime and salt) and subsequent city tour. It’s sunny and close to 30 C, the jet lag is easily forgotten. On Sunday back in the plane, to Puerto Natales. Beautiful flight over the Andes and view over the Lake District and a couple of volcanoes. 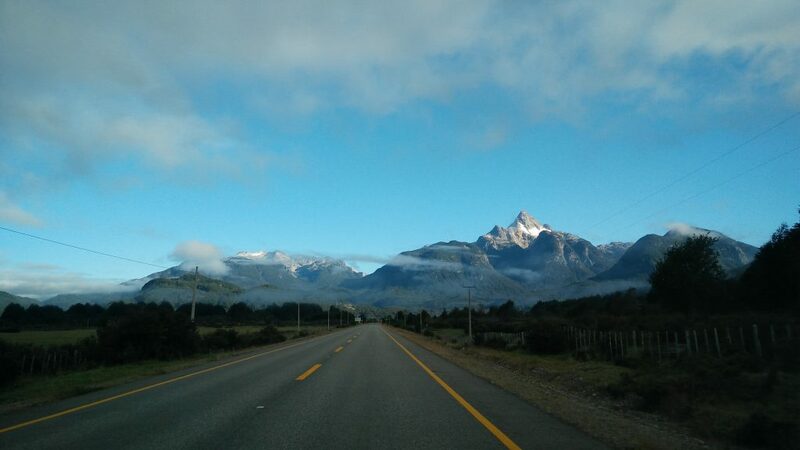 Cloudy when getting into Patagonia. 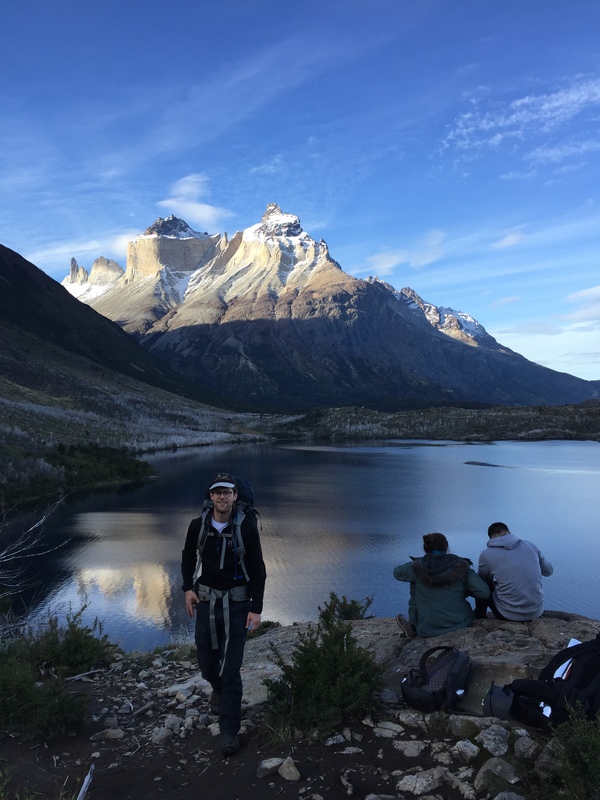 Arrival in Puerto Natales, goretex city of the south! Our friendly host Columbus receives us with tea and shows us around in the city. Last supplies – gas – and we’re ready to go. Monday morning, hikers gathering at the bus station at 7:30. Two hour bus ride, we see condors circling, and then arrive at a ridiculous queue at the park entrance for filling in forms. A next bus brings us to Camping Torres. Strong winds but the new Hubba Hubba tent does a great job. We get lunch from the mini grocery shop and set out for the hike to the Torres Base viewpoint. 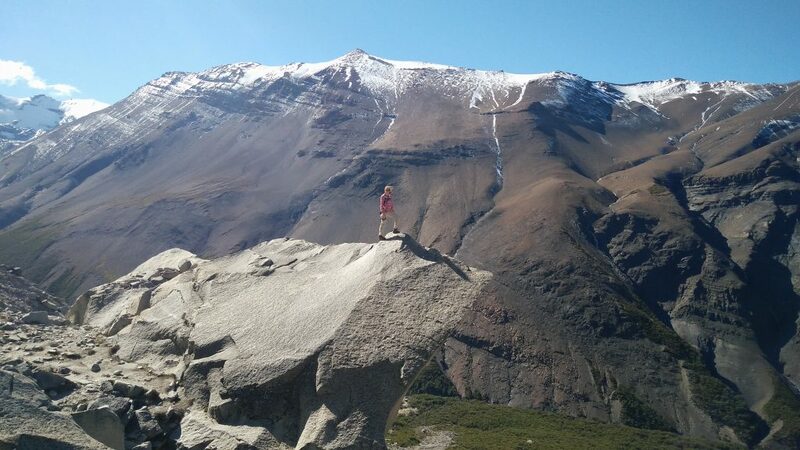 A long hike but with mind blowing view when up at the mirador. 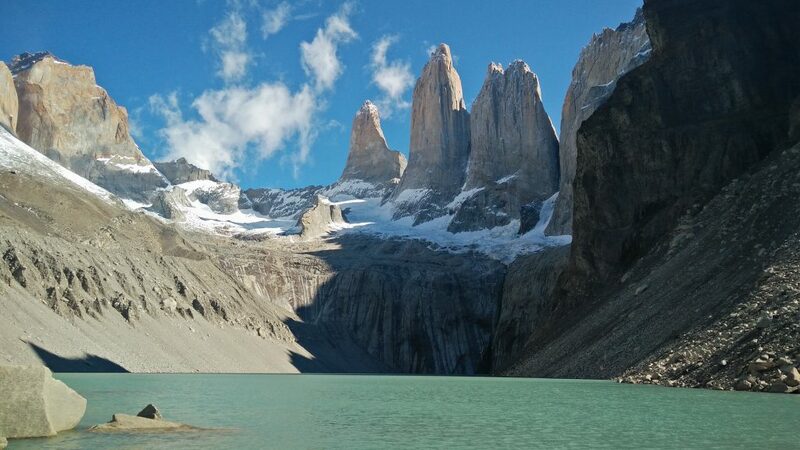 It’s a bright day and the sun casts shadows of the towers on the lake. The hike back is tough and we arrive just before sunset. 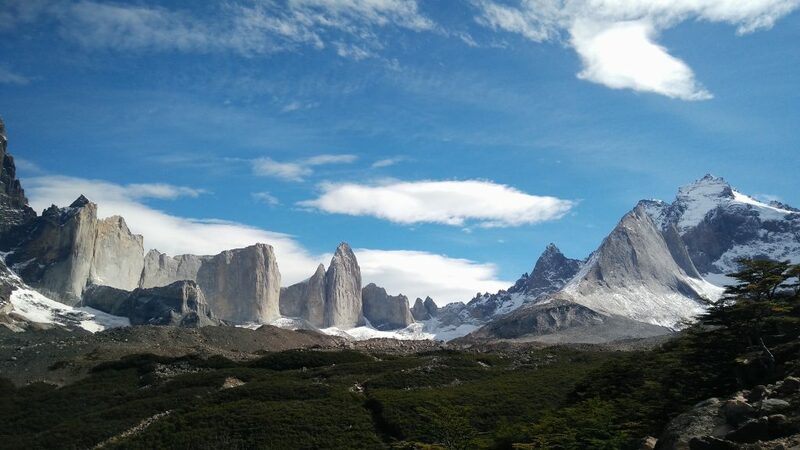 After a rainy night we pack the wet tent and set foot again, now for a less ambitious goal; the Los Cuernos refuge. But first: self made oatmeal as breakfast to start the day. 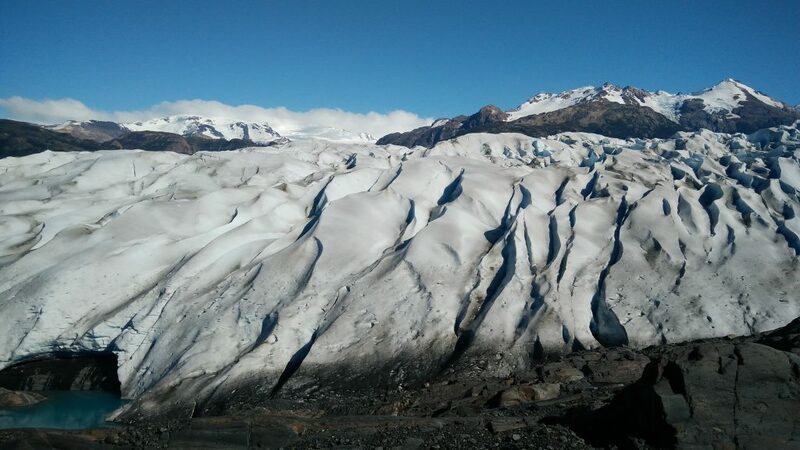 And a second encounter with Chilean bureaucracy when trying to book a glacier hike on Friday. Rest of the day remains cloudy and with light rain, but at least much better than forecast. 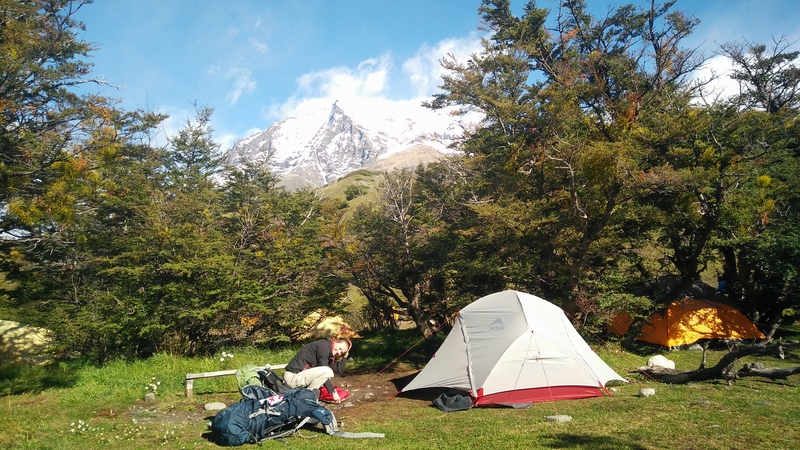 In Los Cuernos we pitch the tent on a platform and fill the bellies fully with the provided dinner. Wednesday starts gorgeous with the sunrise coloring the mountains pink right in front of us. 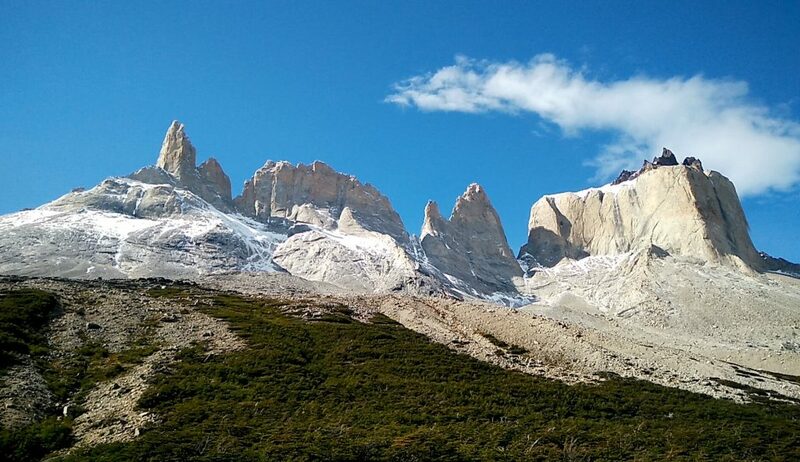 A long day ahead: Los Cuernos – Italiano – Britanico – Italiano – Paine Grande, almost 23 km. 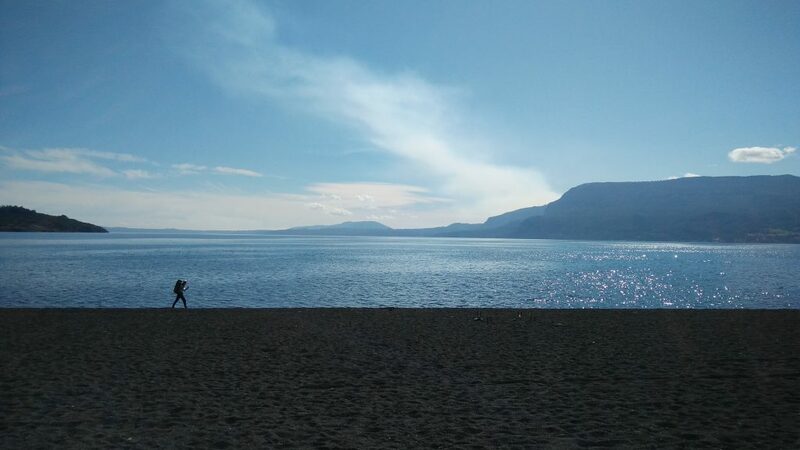 The landscape is quite different, we walk over white stoned beaches along the lake, turn onto a green meadow, and then into the cold forest at Italiano. We leave bags at Italiano when going to the Mirador. First glacier Frances reveals itself on the left, and what we thought last night to be thunder appears to be ice breaking off the mountain leading to frequent avalanche shows. The view is absolutely magnificent. 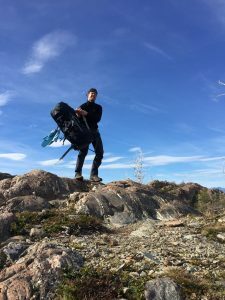 We continue over a ridge, mostly through forest, and arrive at a boulder field with fantastic views on the surrounding mountains. Crossing the field and a last steep climb leads us to the mirador. 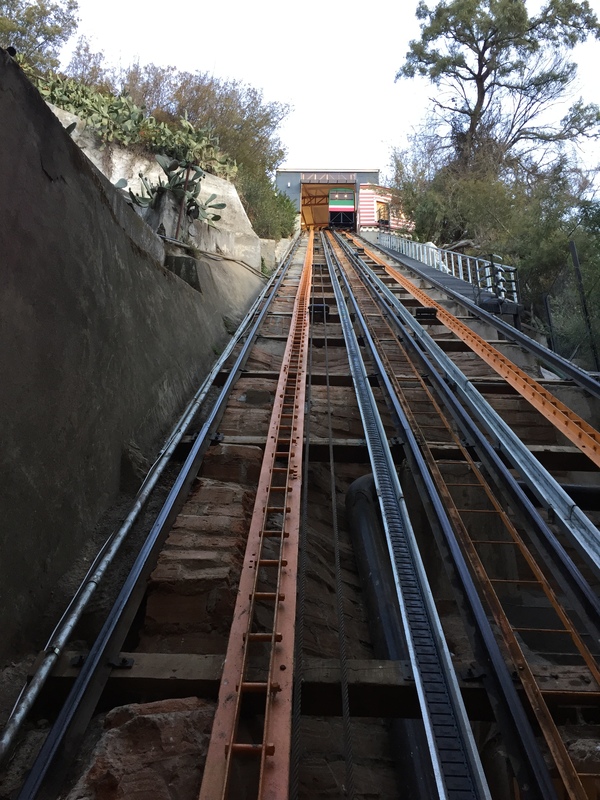 360 degree views on the Torres, the Cathedral and Castillo peaks, and many more. After the long day of yesterday, Thursday is an easier day with less climbing and only 11 km to Refugio Grey. Half way we see the first blue icebergs on Lago Grey, telling that something grand is coming. 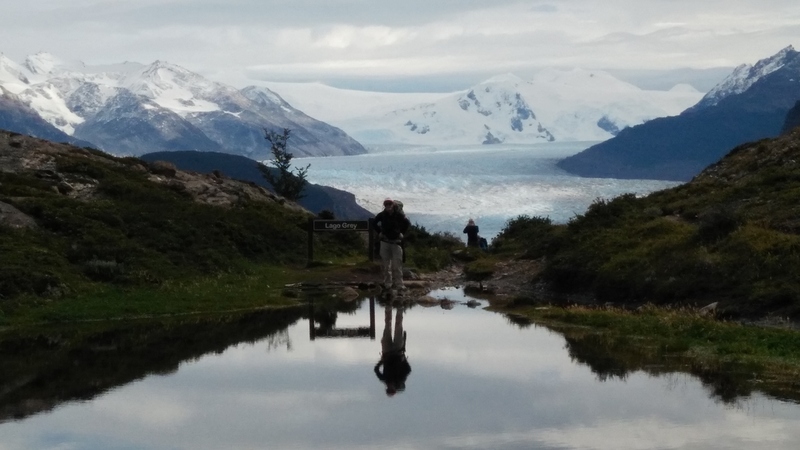 And yes, a little later we arrive at the stunning mirador, with the full Lago Grey in view, ending (starting) at a giant sea of ice. 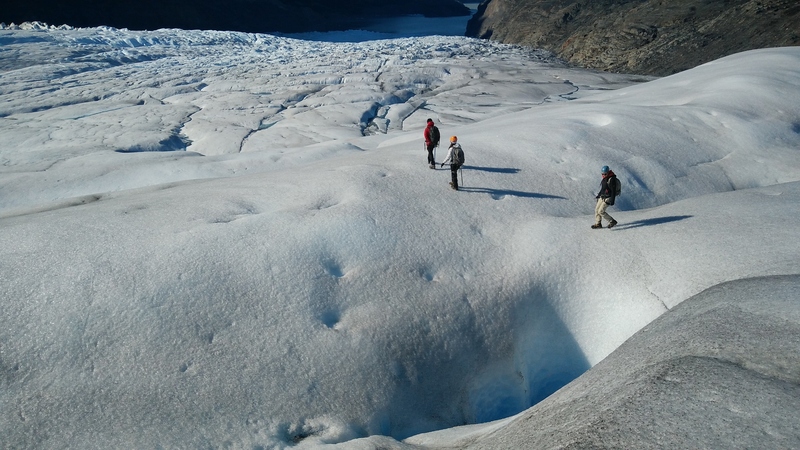 Early arrival allows us to go to the glacier viewpoint and to arrange ice hiking for the next day. Friday early rise and assembly at Bigfoot base camp. 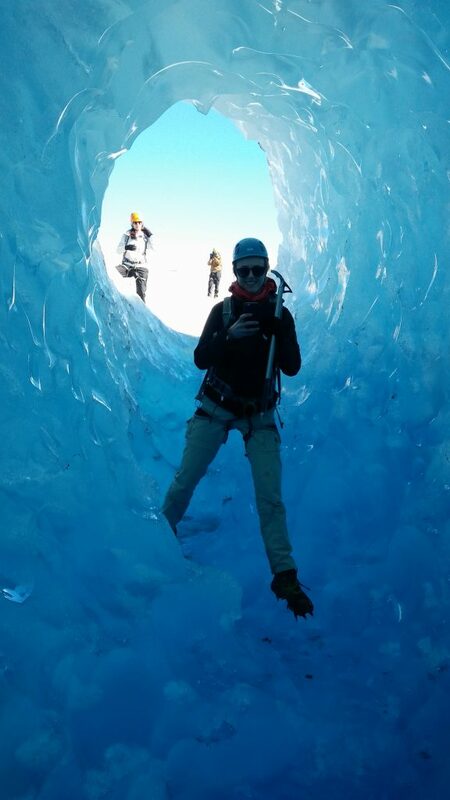 With the zodiac to La Isla and hike to glacier. Crampons, helmets, harness.. ready to go. 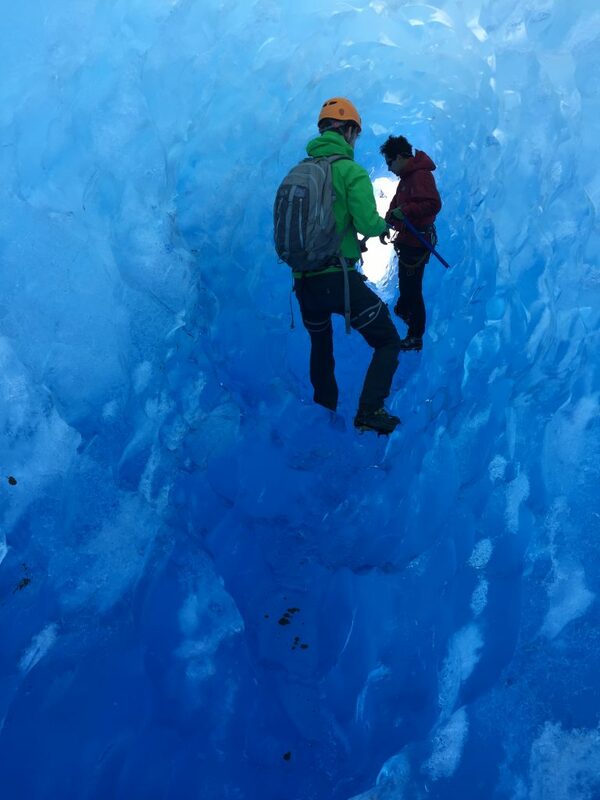 This is an unforgettable experience- we have a great view on the glacier, go through a tunnel in the ice, and awe at the blue streams flowing on and through the ice. 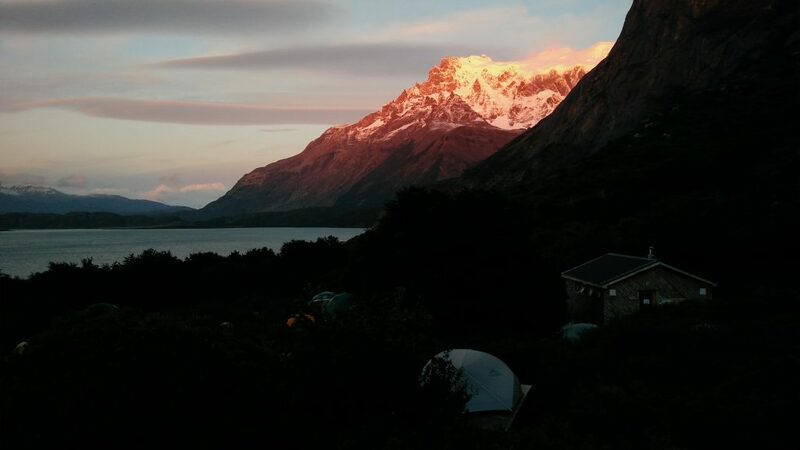 In the evening back in Puerto Natales.. where there is pizza and wifi to plan the next days. Saturday bus to Punta Arenas. The landscape becomes empty and desolated. We see condors, lamas and flamingos. There are seats available on the plane to Puerto Montt in a few hours which we decide to take. Lisa eats ‘pollo a la pobre’, an enormous amount of fries, chicken, onion and eggs. 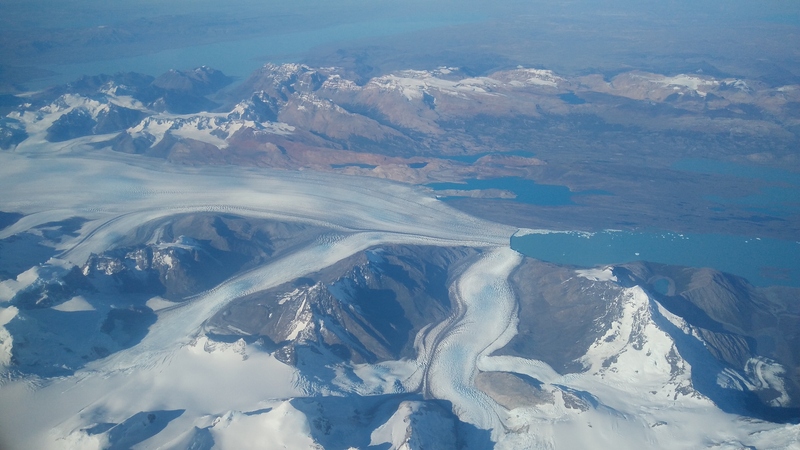 In the air we have an incredible view on the Andes and see the Perito Moreno glacier (which we decided to skip) in all its glory, and the Fitz Roy mountain range. 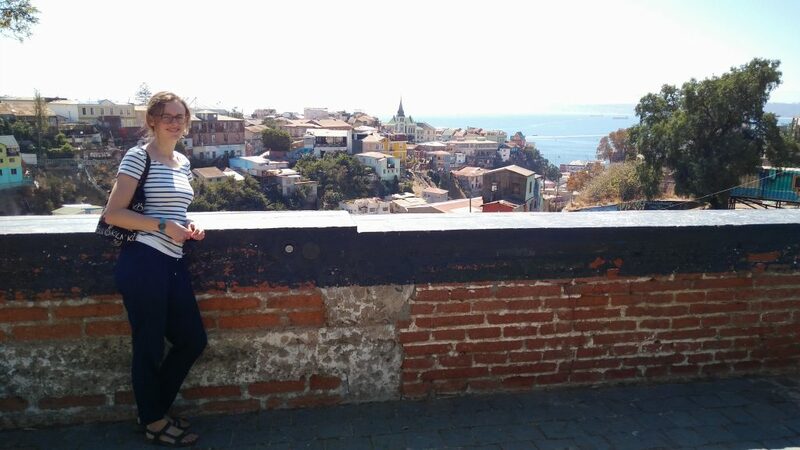 In Puerto Montt we rent a car from a Dutchman who likes talking and stay in the city in a room of a house of two friendly elderly people. In the local bar, Cirus, we sit with the owner Luis at the table who shows Chilean hospitality by offering us wine and local sopaipillas, while we get huge pieces of salmon with lime, too much to finish. 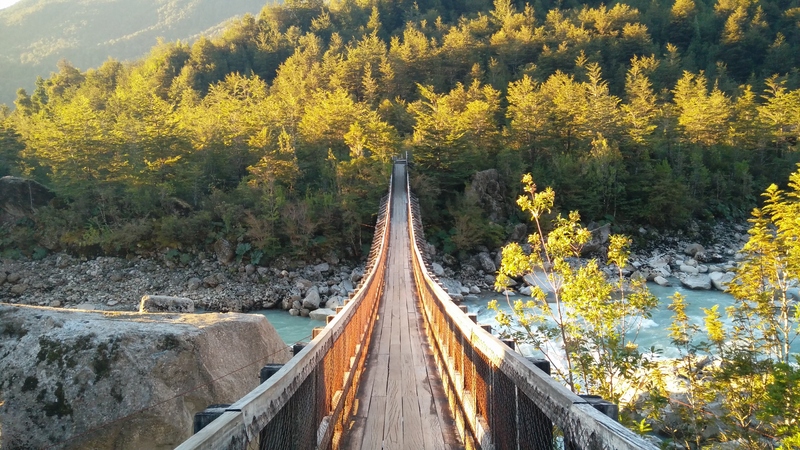 Sunday we enter onto the one and only Carretera Austral and we slowly leave civilization behind, although we enter a world of endless ‘cabanas’ advertised along the road. Parts of the road are gravel and limit us to 30-40 km/h. Poor rental car. There is no boat in Hornopiren today so we get supplies (fuel, food, cash) and go chilling in the termas de Pichicolo. The surrounding rainforest is incredible and we see nice birds in the area; hummingbirds, a kingfisher, black-neck swans. Hornopiren itself is not interesting and mainly features ugly cabanas. Even the horses look depressed. As in all cities so far dogs are abundant. Monday 20 March, we get to the ferry, where gigantic pie is sold for just 2€. A double ferry ride of about 5 hours brings us to Caleta Gonzalo, entrance to Parque Pumalin. Walk to cascade covered in a LUSH (LP talk) rainforest, green everywhere. Camping is a little paradise, very well maintained and with few people. Tuesday, breakfast with blueberries, freshly picked. Then the alerce trail with trees of more 3000 years old. Lunch and hike to El Chaiten volcano, which erupted in 2008 and is still smoking. A very hot day and a tough ascent, like a long staircase. In Chaiten we get supplies (gas!) 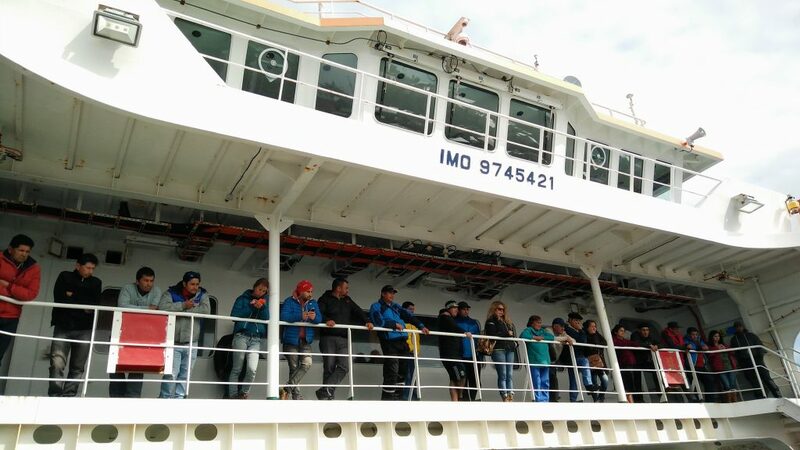 and book a ticket for the ferry from Balmaceda to Chiloe. Nice tarmac road to Amarillo, where we take a left turn back into the park. We get stuck with the car but with some serious efforts. 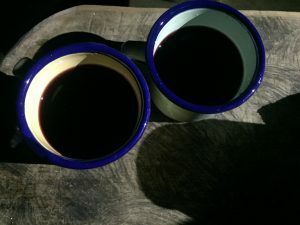 Great dinner at camping Grande where we are the only people besides a Chilean couple who offer us some delicious Queulat wine in return for using our corkscrew. Next morning Lisa headache maybe due to the walk in the sun. Today will be driving day and we have time. 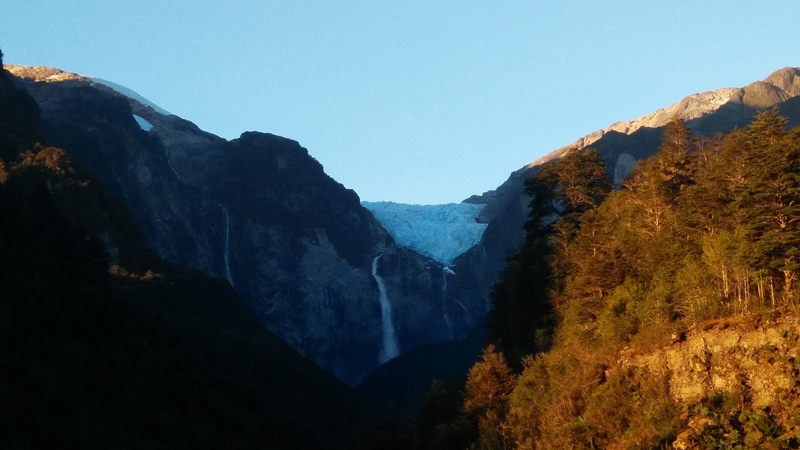 Great route via La Junta (pie limon) to Puyuhuapi (failed to send out postcards) and then to national park Queulat, with the hanging glacier (Ventisquero Colgante). The friendly camping guard Matthias explains about the birds (hummingbird, hued-hued, cuchao, kingfisher) that we saw the days before and at night takes us to the lake which reflects the stars. Full milky way and no moon. But before that he makes us fresh bread from the oven in his cabin behind the duchas. 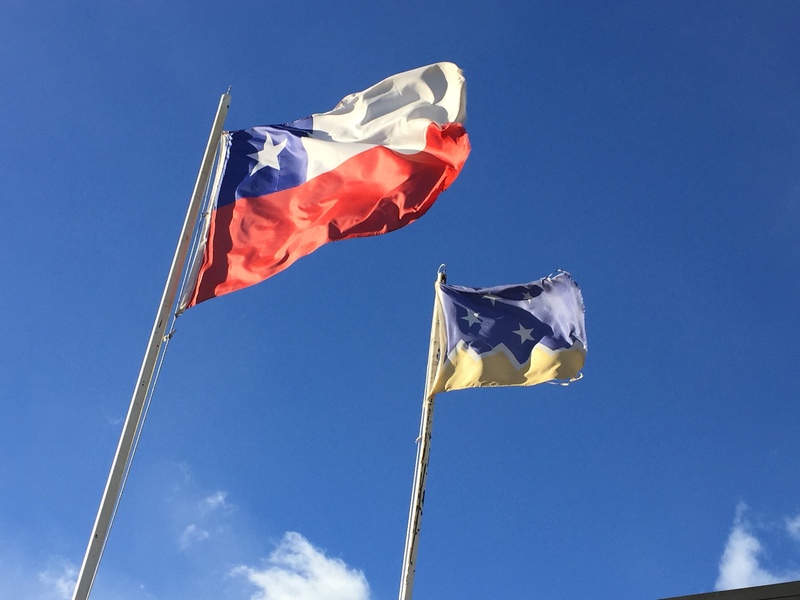 Thursday we planned to stay another day in Queulat but weather looks cloudy so we pack and head out to Coyhaique. An incredibly scenic route with glaciers, rivers, forests, and hairpins on gravel roads. 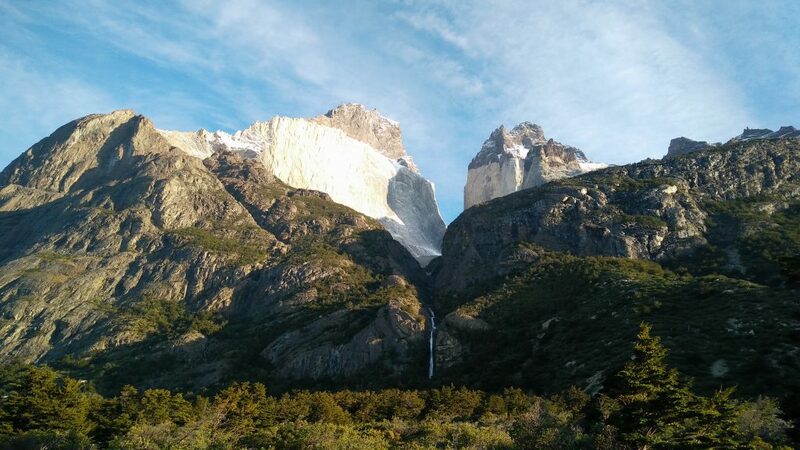 It is like Yosemite but without the tourists and with glaciers. We also see some lamas. Coyhaique is not so interesting but we finally find a post office and get some good food, ceviche and tartare patagon. We camp in Mañihuales at a house where time stands still and an old man enjoys the sun in front of his house. There are no other campers. We enjoy a camp fire and Chilean Ventisquero rojo and hot showers. Next morning mystic sunset due to the fog. Fresh hot bread from the mercado. Back over the hairpins and on time for road closure at Queulat. 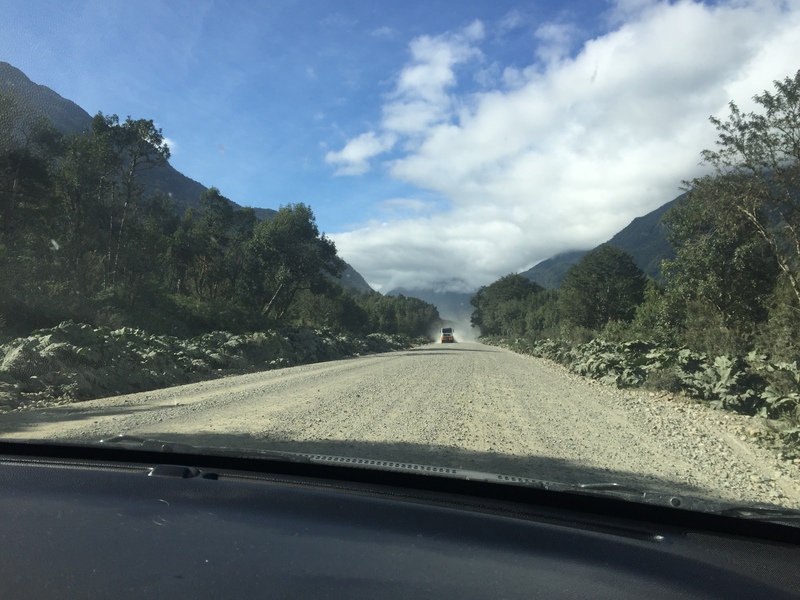 After Puyuhuapi we get into a drift due to the loose gravel and do a 180 on the carretera. Everything OK but car in hopeless position. With sheer luck the carabineros arrive, and a little later a couple of 4x4s are pulling out the car from the ditch. They disappear as fast as they came and miraculously everything still works and no visible car damage. We take it easy towards La Junta and have lunch (learning that guadittas are stomach) to calm down. 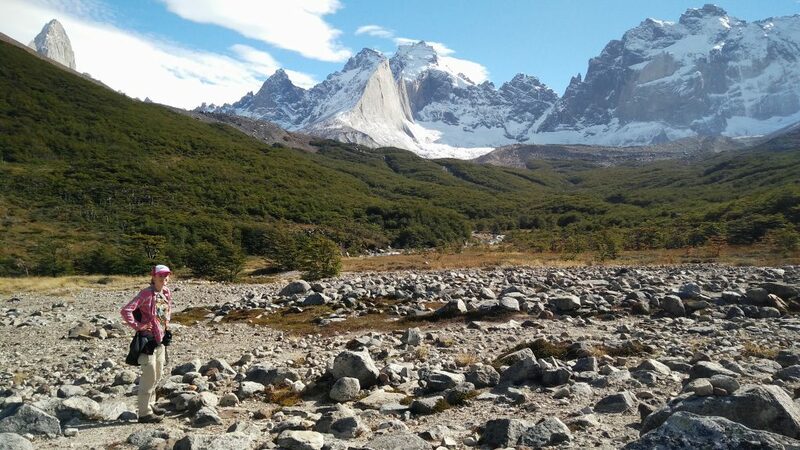 Then the gravel road to Balmaceda, a little village which does not seem attractive at first sight but which appears to be a stunning place once the sun breaks through the clouds and we make beach walk accompanied by dolphins in the river. Saturday early rise, strong winds and some sun, we take the boat from Balmaceda via Melinka to Quellon on Chiloe. 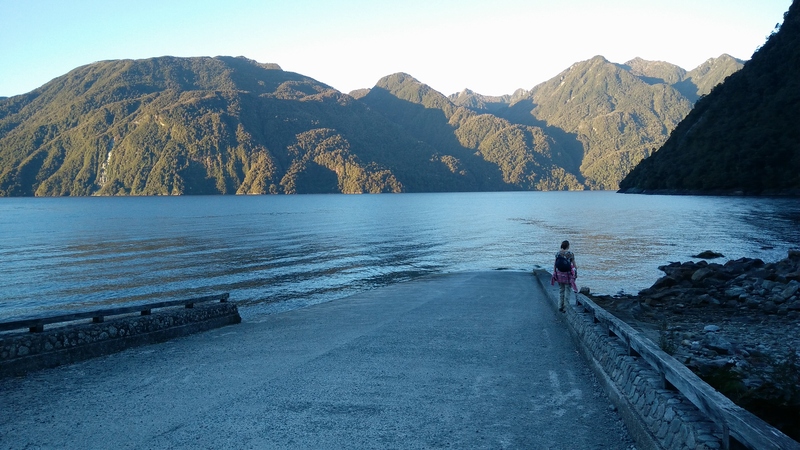 We are the only ‘normal’ car on the boat and we see mainly truckers and some families and some tourists including a Dutch lady traveling through Chile for many months. 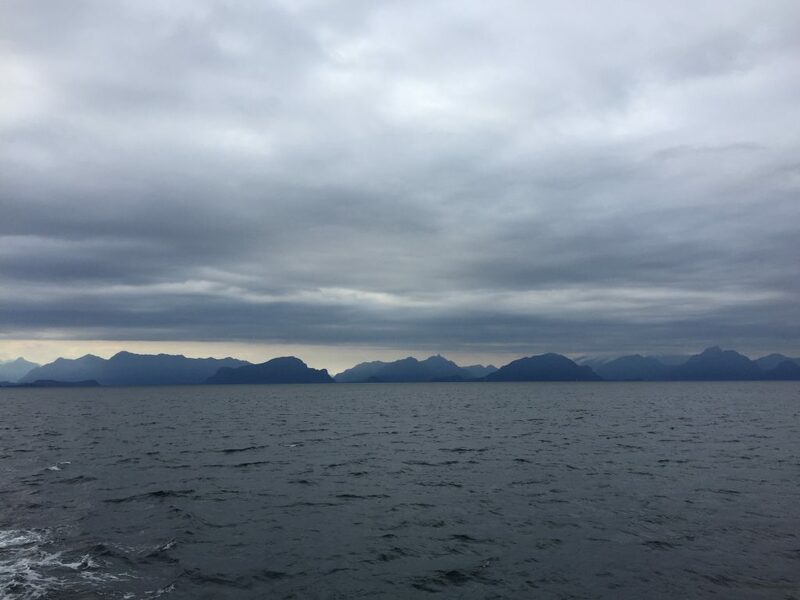 We see an otter upon leaving but in the remaining 9 hours on the boat we don’t see the blue whales that are swimming here close to the pacific coast. We arrive on time in Quellon and take Miguel, an Italian hitchhiker, to Castro. It takes some effort to get a bed and food but finally we are ok.
Sunday morning we have fantastic breakfast in cafe el Puente, French toast, poached eggs, sencha tea, yogurt and fresh fruits. We visit the wooden church, where service is going on. We continue to Quemchi in search of Curanto, the local Chilote dish, but Quemchi is deserted. 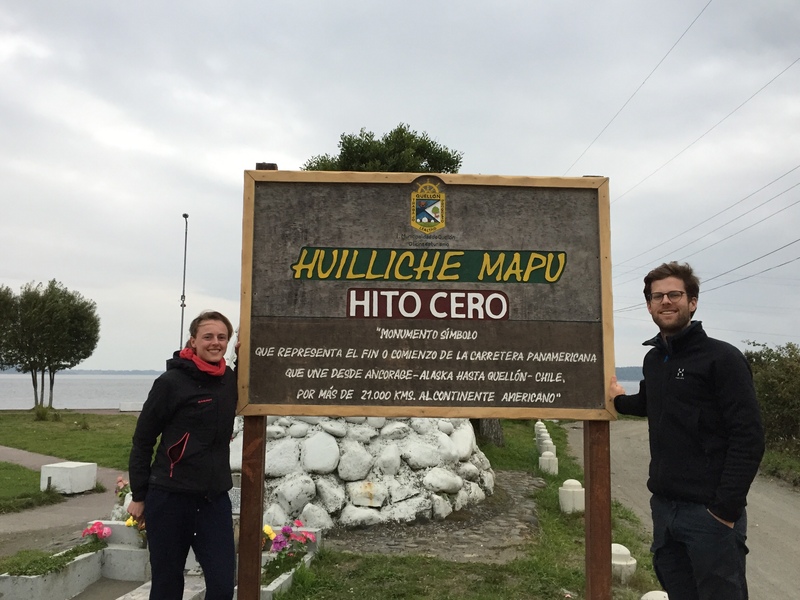 We continue via Ancud to Quetalmahue, where we find the magic dish, containing shellfish, mussels, chicken, sausage, pork, potatoes. It’s tasty and it’s a lot… almuerzo and dinner at once. Nearby supermarket is from another era. The penguins have left the national penguin monument but the pacific coast is still worth a visit and we find a cozy cabana at the sea side. The use of wood heating is very common here, the smell of burnt wood is everywhere in the streets in Chile (and probably not so healthy). Monday 27 we get up and go for a walk along the coast, and still see some last penguins. The road back to Ancud reminds of the English countryside; hilly and grassy with cows. The coast is rough like in Scotland. 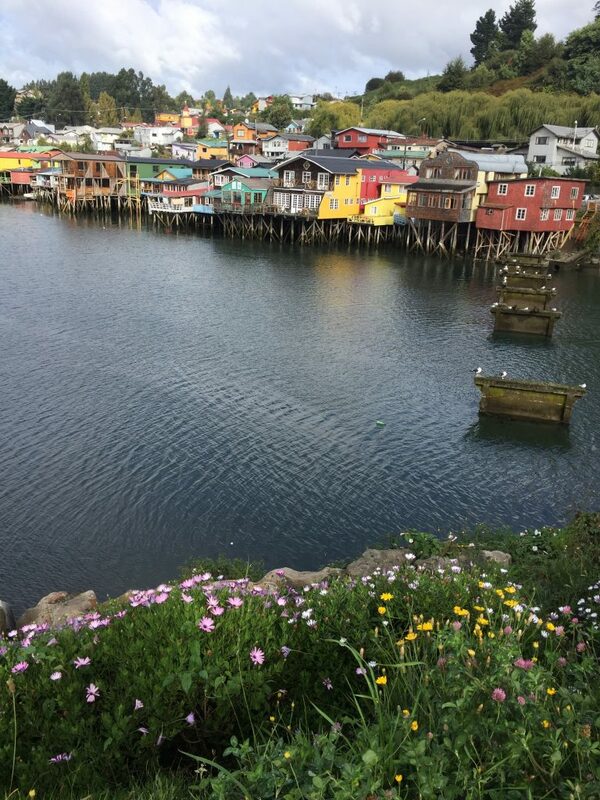 We travel back to Puerto Montt to hand in the car, and continue on the bus to Osorno. 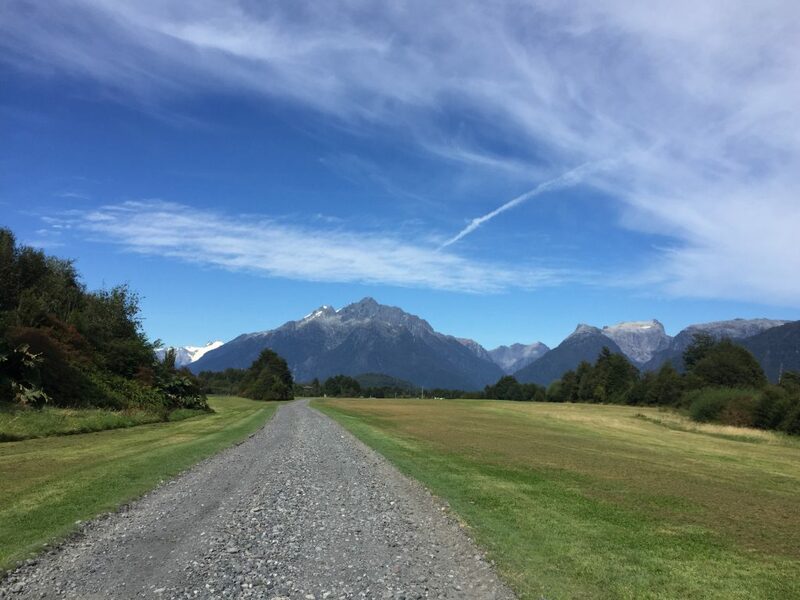 In Osorno we connect to Bahia Mansa, where we seek information on boats to Caleta Condor, a paradise on the coast only reachable by boat or 2 days hiking. We meet Patrick Lightfoot, who offers to help and a stay in his (dirty) cabana. What follows are incomprehensible stories: pumas attacking tourists on the trail, banjeros robbing them and throwing them in the sea, his job as Los Angeles police officer, as helicopter gunner in Iraq, at the CIA, the previous owner of his house who worked for the Mossad, the watch of Eichmann, the war between Mapuche and Chilean government and him supplying weapons, and his plans to start helicopter flights in the area for adventure tourism. Error. Next day it turns out his talks indeed are idle and he has nothing arranged for us to go to Caleta. The fishermen are not very eager to help and so our efforts strand. Here off-season tourism is absent and would require advanced planning that we didn’t do. We take the bus back to Osorno and continue directly to Pucon. 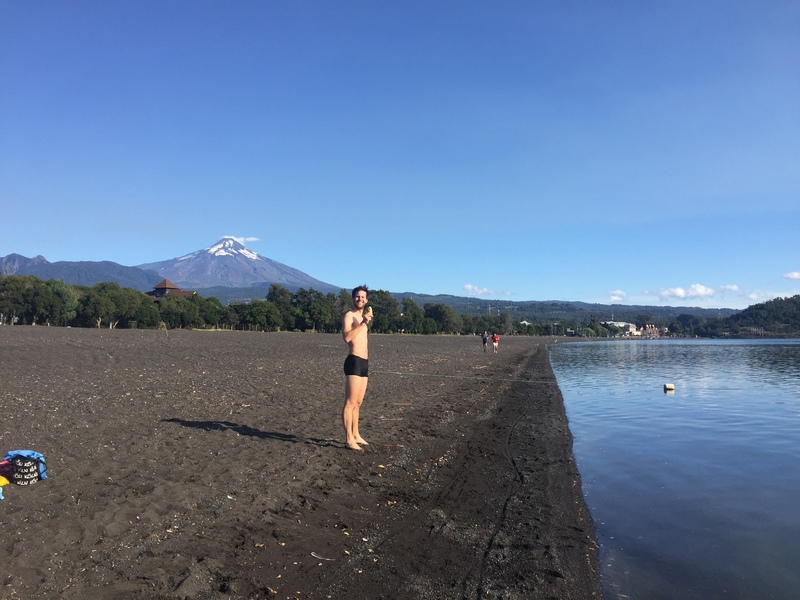 The Caleta deception is easily forgotten, as we find a camping at the lake, completely for ourselves, with full sunshine, set against the picturesque volcano Villarrica that we want to climb on Thursday. 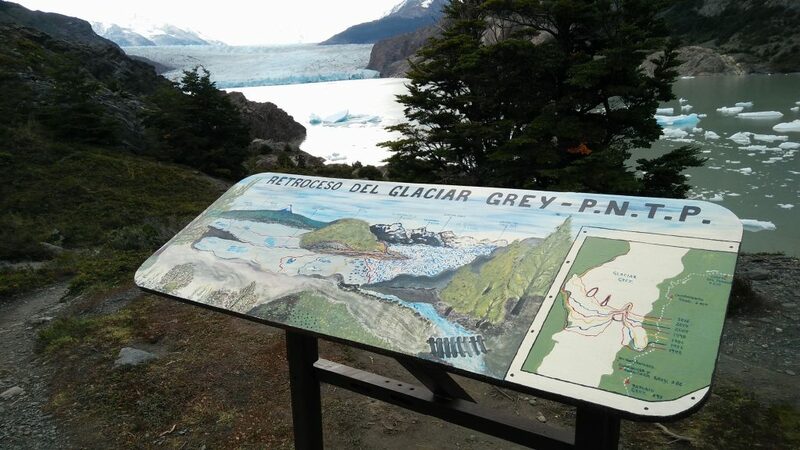 Wednesday we have a very relaxed morning and in the afternoon go to the Peumayen termas, which is nice but not very special. In the evening we get our stuff ready for the vulcano climb next day. At night we get heavy rains but the Hubba doesn’t care, we stay dry. Early morning the sky is clear and we have good hopes for the climb. The gear (crampons, pickle, helmet, sledge) is ready at Aguaventura and so are we. But clouds have appeared on the vulcano and after about one hour drive, at the ski station, the sun set reveals many clouds on the mountain and the trip is cancelled. 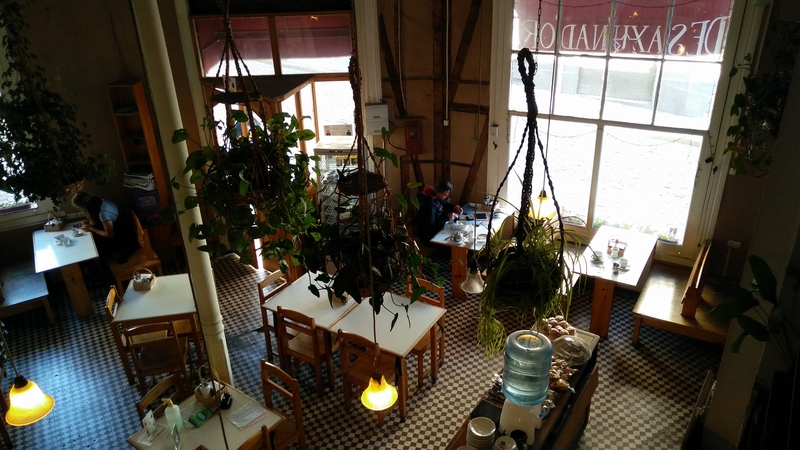 In the evening we take the night ‘cama’ bus to Valparaiso – but not before we have visited the nice Trawen restaurant in Pucon once more for salads and cakes. 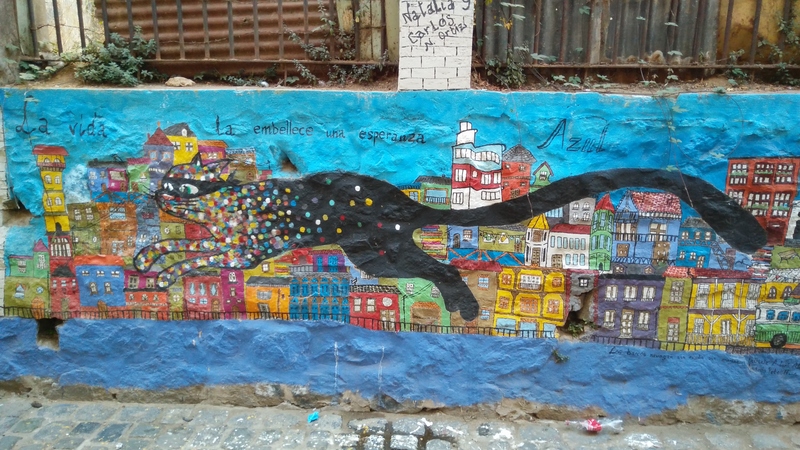 The last days in Chile in Valparaiso are a dream. Great weather, and views over the city. A great place to stay (Morgan). Good dining (Apice) and ceviche. Visit to the beautiful house of Pablo Neruda. 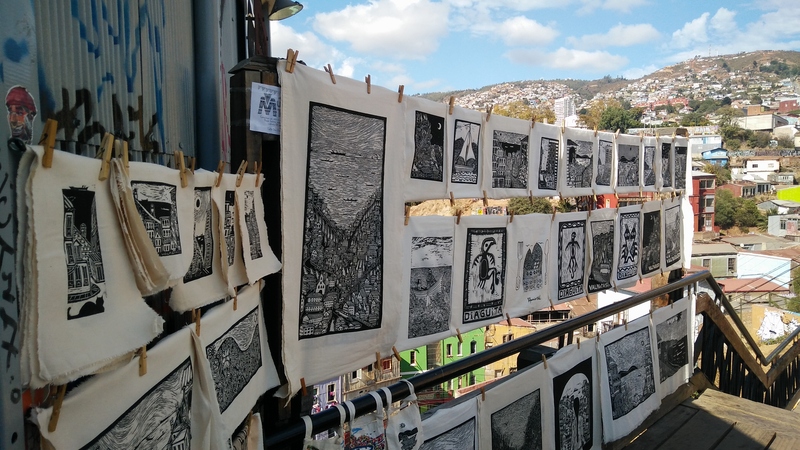 Shopping in the streets of Cerro Allegre.